Contains mainly typed and hand written manuscript materials. Also contains some print materials and a few photographs. North Carolina, Office of the Governor. Arranged into three main series: Commission Files, Summaries and Working Files. The Commission Files Series is arranged alphabetically by folder title. The Summaries Series is arranged numerically and then alphabetically according to a number scheme originally assigned by the Commission members. The Working Files Series is arranged alphabetically first by state agency and then by folder title. Processed by David B. Chiswell and Ruth Cody. Finding Aid by Ruth Cody and Maryellen Tinsley. On January 16th, 1973, Governor James E. Holshouser, Jr. issued Executive Order Number 1 authorizing the creation of the Governor's Efficiency Study Commission to conduct intensive research on programs and procedures involving the administrative and operating functions of all departments, agencies and commissions of the state government. The Executive Order empowered the representatives of the Commission to investigate and analyze the different facets of state government as they deemed fit. It also directed every office and employee within the Governor's authority to provide all information and assistance necessary for the Commission to make its determinations. According to Governor Holshouser, this effort would complement the reorganization plan of the early 1970s that revised, in stages, the basic structure of state government and its programs. The Governor appointed Archie K. Davis as the Chairman. Davis had served as Chair to the Board of Wachovia Bank and Trust, President and Chairman of the Research Triangle Foundation, President of the American Bankers Association, and President of the United States Chamber of Commerce. As Chairman, Davis was charged with authority to form a non-profit corporation and to secure the personnel, facilities, and financial assistance to carry out the study. The order further provided that the officers and directors of the corporation would be elected following consultation with the governor. These members were composed of industry, business, educational, and professional representatives. The order also named Warren King and Associates, a private consulting firm, to coordinate the project and advise the Commission. The study examined the activities of almost all of the executive branch of state government, including the offices of the governor, lieutenant governor, the nine executive departments whose secretaries answer to the governor and the university system. Additionally, the six departments headed by elected members of the Council of State participated. Members of the Executive Committee directly oversaw study teams to evaluate seven specific government functions: General Government, Regulatory and Protective, Social and Human Resources, Transportation, Agricultural and Natural Resources, Public Instruction, and Higher Education. Team members conducted studies through interviews, reports from internal and external sources, compilation and accumulation of research data, and personal observations. They then formulated recommendations which were submitted to the Executive Committee and the Governor in a series of Final Reports. These recommendations, which encompassed everything from the major restructuring of state agencies to the money and time spent typing specific forms, were either implemented, found unacceptable, or marked for further study. The Commission disbanded at the end of 1973. Initially, the work was continued by the by Office of Administrative Management Analysis. Later this office was replaced by the Office of Administrative Analysis, which was created to reduce costs and increase efficiency of the state government. Before the end of 1973, the Governor's Efficiency Study Commission had submitted almost seven hundred recommendations. Some recommendations required legislative action, but most could be implemented administratively. The Holshouser Administration instituted almost six hundred of the recommendations over a period of twenty-four months and was credited with an annual savings of over sixty-three million dollars. Some observations have been referenced in later years as future governors and state officials addressed issues of efficiency and government change. Occasionally, recommendations originally marked for more study or considered unacceptable in 1973 were implemented during future terms. The bulk of the records were transferred from the custody of the Department of Administration to the State Archives on 12/17/1975. [Identification of item] Mars No. 397 and 397.1, Governor's Efficiency Study Commission, State Archives of North Carolina, Raleigh, NC, USA. Related materials may also exist in the records of the Department of Administration, Office and Administrative Analylis, MARS No. 40.70 and the Department of Administration, Office of Policy and Planning, MARS No. 40.52 and also in the Records of Governor James Holshouser, MARS No. 371. 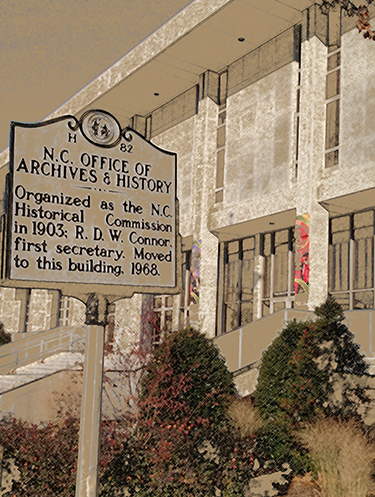 A small amount of materials related to the Governor's Efficiency Study Commission can be found in the Collection of Archie K. Davis Papers located at the University of North Carolina, Wilson Library in Chapel Hill, North Carolina. This collection contains correspondence, minutes, memoranda, notes, forms, reports, statistical data in a variety of formats, press materials, printed matter, some published materials and a few photographs along with other manuscript materials specific to a variety of government functions. Ranging from 1951 to 1978, the collection is broken into three series. The Commission Files Series contains the materials pertaining to the creation and administration of the Commission. The Summaries Series includes summaries and Final Reports from study teams. The Working Files Series contains the materials accumulated and created by the study teams throughout the course of the study. The bulk of the materials are from 1973 to 1975. Those materials dated prior to 1973 are most often materials accumulated by the teams for their research. Materials dated after 1973 are from the Office of Administrative Management Analysis (before 1975) and the Office of Administrative Analylis (after 1975). There is a small amount of materials dated between 1975 and 1978, which generally refers to the overall results of the Commission and the progress of some of the implemented recommendations. North Carolina. Department of Administration. North Carolina State Local Task Force, "New Directions"
North Carolina Symphony Society Inc.